Turtle Beach's incredibly comfortable Elite Pro Tournament Headset is a high-end set of gaming cans worth wearing for extended gaming sessions. No surround sound on PS4 without T.A.C. You don't have to spend a huge amount of cash to get the best gaming headset – but if you do splurge, then you should get something that feels extensively refined and as premium as the price tag suggests. Thankfully, the Turtle Beach Elite Pro Tournament Headset fits the bill. Yes, its name is more than a mouthful, but this is also more than your average gaming headset. It's also a more robust and polished offering than most of Turtle Beach's offerings, setting a high-end example of what the company is capable of. It's certainly not cheap at $199.99 (£169.99, AU$299), and spending extra for the optional Elite Pro Tactical Audio Controller ($149.99, £149.99, AU$249) to enable some features might be hard to swallow. Still, the Turtle Beach Elite Pro Tournament Headset excels with great audio and seriously impressive comfort, and has some nice advanced options if you're willing to spend extra for those perks. After reviewing the curiously awkward Turtle Beach Stealth 600 headset recently, we weren't really looking forward to sticking the Elite Pro on our noggin. Thankfully, those fears were unfounded: this is truly one of the most comfortable headsets we've ever used. It doesn't really look that way at a glance. The padding on the cups is amazingly thick, but the actual ear holes look small and confining. But you'll forget about all of that once it's on your head. The ear pads are spongy cushions that feel like memory foam in the way they conform around your head, and the use of cooling gel in the padding – yes, really – makes them feel like a dream when you pop them on for a frenzied gaming session. We've never felt any other headset quite like it. And since they encircle your ears and mold around them, the Elite Pro is also excellent at blocking out external noise. That makes them especially ideal for LAN events and esports tournaments, as the name rightly suggests. The Elite Pro is plenty comfortable otherwise, as well. The cups slide up and down the plastic arms attached to the headband, offering enough variance to find a nice balance for your head size, while the soft strap beneath the top of the band can be adjusted to add or remove tension. Truth be told, we don’t feel much of a difference between the settings, but it feels good all the same. Visually, the Elite Pro is a more refined take on Turtle Beach's usual aesthetic—you won't mistake it for anything other than a gaming headset, thanks to the chunky plastic and bright orange accents. The microphone pops on and off with ease, as needed, and the headset comes with 3.5mm analog and USB digital connectors for various devices. There's also an in-line control on the cord with a volume dial and microphone mute toggle. 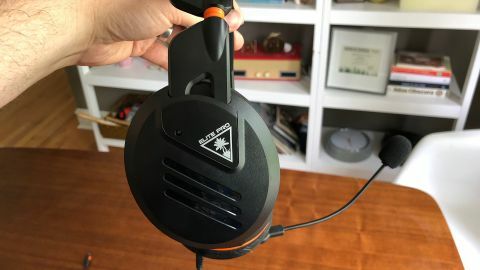 Thankfully, the Turtle Beach Elite Pro Tournament Headset doesn't disappoint when it comes to actual audio playback, although there's some variance depending on which device you're using and how you hook up to it. Using the 3.5mm headphone jack, you can easily plug into a PS4 or Xbox One controller, connect to a PC, or use it with a smartphone, tablet, and loads of other devices. Testing that stereo approach in Call of Duty: WWII for PS4 proves quite nice indeed. The Elite Pro's 50mm drivers produce a very balanced soundscape in which everything seems to get equal weight. Footsteps and firearm rounds ring through cleanly and clearly, and when playing, we feel fully immersed despite the lack of virtual surround sound on the platform. Switching over to Rocket League, we admittedly wanted more of a bass kick in the mix — especially after recently testing the excellent Beyerdynamic Custom Game headset, with its unexpectedly effective bass sliders. With music blaring, the Elite Pro's output also feels just a hair more confined than the Custom Game, but it's not a world of difference. Overall, we were very happy with the playback performance. On Xbox One, you can enable Windows Sonic support for virtual surround sound, but the difference seemed extremely modest to our ears in both Halo 5: Guardians and Rocket League. The results sounded a little bit cleaner, but not strikingly so. Meanwhile, the Elite Pro USB Amplifier connector included in the PC Edition of the Elite Pro lets you activate DTS 7.1 virtual surround sound in Windows 7+ via Turtle Beach's drivers. And it's suitably impressive, delivering a broader aural field to amplify your gaming. On PC, you can also use Turtle Beach's neat "Superhuman hearing" feature, which amplifies in-game footsteps and other subtle noises, and lets you tap into a few different audio mix presets. The USB Amplifier can also be plugged into a PlayStation 4, but it doesn't activate any kind of virtual surround sound. It purportedly boosts the level of the audio output, but we can't tell a difference while playing Call of Duty: WWII. At least it enables microphone monitoring, so that you can hear yourself while chatting online. The aforementioned Elite Pro Tactical Audio Controller (T.A.C.) mixamp has a built-in DAC and brings virtual surround sound to PS4, plus it offers more control over the audio mix and lets you chain multiple T.A.C. devices together for LAN play. For serious audio aficionados and LAN fanatics, it might be worth the investment. Everyone else can get by with just the headset. And the Elite Pro headset's bendable, included microphone sounds great in our experience—much clearer than the Stealth 600's flip mic. Turtle Beach sells an optional noise-cancelling mic, but it's really not necessary for gaming. The Turtle Beach Elite Pro Tournament Headset is designed for competition and it really does excel at that, thanks to its incredible comfort, noise-isolating cans, and sharp game audio. You might find slightly fuller sound with more of a bass kick from other headsets, but it's hard to argue with what Turtle Beach delivers here. That said, spending $199.99 (£169.99, AU$299) on a headset that lacks some functionality without an additional $149.99 (£149.99, AU$249) peripheral – especially if you're on PS4 – can feel a bit frustrating, and there's a lot of competition in the high-end wired gaming headset space. But if you like the look here and demand advanced features from a gaming headset, then you won't be disappointed with the Elite Pro.